Form W-2 includes information on employee wages paid the previous calendar year and withholding from those wages, as well as information on benefits, and other deductions from wages. Copy A goes to the Social Security Administration (SSA). Copy A is usually printed on a red form. Copy D is for the employer's records. W-2s are due to employees by the end of January, for the previous calendar year. If January 31 is a weekend or holiday, the reports are due the next working day. Below are the key end-of-year payroll tax reporting due dates for the current year. 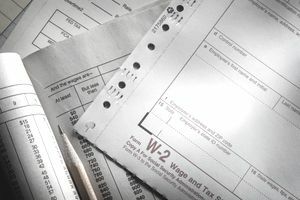 W-2 forms are due to the Social Security Administration by January 31. After you have given W-2 forms to employees, you must also submit these forms, along with transmittal form W-3, to the Social Security Administration (SSA). The January deadline is an attempt to curb tax fraud, but it means that you should give W-2 forms to employees earlier in January, so they have an opportunity to look them over before they are filed. Earlier distribution to employees will lessen the errors in the W-2 forms, so you don't have to file a corrected W-2. The information for this form comes from your payroll register, which shows year-to-date totals for each employee for wages and withholding, along with deductions for medical plans, health savings accounts, and other items. Time required: Depends on the number of employees and the number of deductions and additional payments. Employer information: For each W-2 you prepare, you will need to include information about your business, including employer ID number (EIN) and employer name and address. Control number: You may want to add an internal control number on each W-2 if you are paying many employees. You can generate the number yourself, or your payroll preparation software may generate this number. Total wages, tips, and other compensation (Box 1). This is gross pay for all hourly and salaried employees. Total Social Security wages (up to the Social Security maximum)(Box 3). Some pay is not included in Social Security wages, so you will need to reduce the entry by these amounts. Medicare tax withheld (Box 6). This amount includes the amount of additional Medicare tax for higher-paid employees. Other payments. You may have paid advance EIC payments (earned income credit)(Box 9) and dependent care benefits (Box 10) paid to employees. On each W-2 you must check the appropriate box if the employee participates in a retirement plan (Box 13) or a non-qualified plan(Box 11), if this employee is a statutory employee (Box 13), or if the employee received third-party sick pay (Box 13. Spend time making certain that the information you are providing to employees (and ultimately to the Social Security Administration and IRS) is accurate. Check your payroll register totals for the year and run a W-3 to assure the accuracy of all the information you are submitting. If you are printing your own W-2 forms, you may obtain them from several sources. An online forms supplier or office supply store. Print out the forms, checking to see that they align with a pre-printed format ​if you have one. To the Social Security Administration - Copy A. The SSA requires that you send Copy A from each employee's W-2, along with Form W-3, by the end of February. Keep Copy D for your records. Your business's state tax ID number is NOT your state sales tax ID number. Many states use the federal tax id number (EIN) and add digits onto the end. Check with your state department of revenue for information. Tip income. Employee tip income is subject to Social Security taxes and Medicare taxes, including the additional Medicare tax. If you have more than 4 items for Box 12, you will need to put the additional items on a second W-2. But don't include the employee's wage and withholding on this additional W-2. Form W-3, along with Copy A from all employee W-2 forms, is due to the Social Security Administration by January 31. When you have completed the W-3 and you have all the W-2 forms, send these to employees as soon as possible, so they have an opportunity to review the forms. If they find errors, you can fix them before you send the consolidated report to the SSA by January 31. Disclaimer: The information in this "How To" is for general purposes, to help you collect the information you need to prepare and print W-2 forms. It is not intended to be tax advice and in no way does this information attempt to be comprehensive or to tell you all the information that must be included in your W-2 forms. Talk to your tax professional for information about your specific situation.